The Global Bioeconomy Leadership Award was established by Biofuels Digest and Nuu Media to recognize individuals who offer a bold vision and have made a global impact in the biotechnology space. 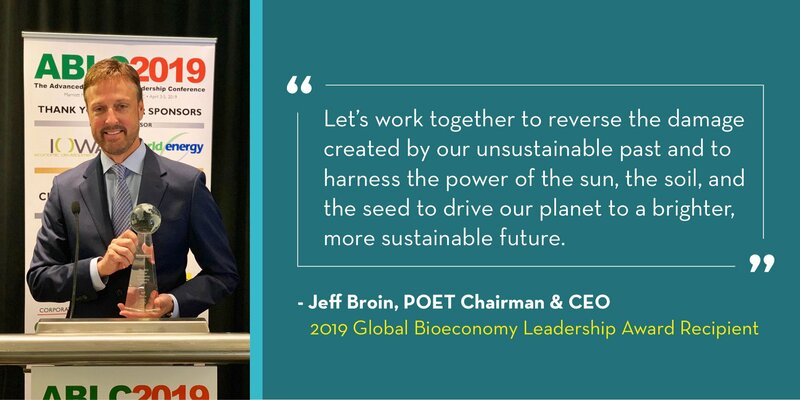 On Thursday, April 4, POET CEO and Founder Jeff Broin was recognized with this award for his vision and leadership in pioneering new technology and building POET into the largest biofuel producer in the world. Previous award recipients are former Iowa governor and U.S. Secretary of Agriculture Tom Vilsack (2013) and former Navy Secretary Ray Mabus (2015), recognized for his work in developing the Great Green Fleet, an initiative that demonstrates the Navy’s efforts to transform its energy use. All three individuals have demonstrated a commitment to articulating a vision that has a wide reach, says Jim Lane, editor and publisher of the Biofuels Digest and CEO of Nuu Media. Broin has not only set forth a vision but also delivered on that vision and remained committed to the process. “It’s very important to articulate a vision, and then you have to deliver on that vision, sustainably and affordably,” Lane said. In its more than 30-year history, POET has pioneered new technology and innovations in biofuels and coproducts. POET has continually found ways to make biofuel production more efficient at its network of 27 bioprocessing facilities and to develop new coproducts and new sources for biofuel. POET, through its joint venture with Dutch biotechnology company DSM, also operates a commercial-scale cellulosic ethanol plant, Project LIBERTY, in Emmetsburg, Iowa. The company recently was named to Fast Company’s list of Most Innovative Companies for transportation. Broin received the award during the Advanced Biofuels Leadership Conference at the Mayflower Marriott Hotel in Washington. U.S. Secretary of Agriculture Sonny Perdue was the keynote speaker, and other speakers included leaders across the energy, agriculture and policy sectors. “Biofuels are turning the trajectory of our economy away from fossil fuels and toward a renewable future,” Broin said. “I’m deeply honored by this award and very proud of the contributions POET has made over the past thirty years to unlock the potential of biofuels and bioproducts and generate new demand for America’s family farmers. That’s what Broin has done, and the visibility of his and POET’s impact across the industry is clear, Lane said. Broin has shown both market and technological leadership. “He’s led in market leadership in terms of helping to bring the industry to life — farm group to farm group, co-op to co-op and getting this model to work. He has been getting growers to invest in those early days. Today, he continues to be an advocate in Washington and around the world for the value of these products and this sector and what it can do,” Lane says. Biofuels are the solution to the challenges facing this world due to climate change, Broin said. The need today is greater than ever before, Broin said. Lane pointed to POET’s efficiencies as evidence of Broin’s and POET’s success. He also said that Broin’s vision specifically in new areas like cellulosic ethanol has continued to move the industry forward. As the world becomes more fragmented, leaders play an even greater role in underscoring those issues that are important, Lane said.